Fans of The Ravenels series will recognize Dr. Garrett Gibson as the pragmatic, dedicated doctor who cares for Winterbourne employees and their families during the day and spends the rest of her time treating those in the poor sections of London who cannot afford her services. She is determined to use her hard-won medical knowledge and skills to educate and care for as many people as possible, especially the women of England who have been taught that to have an interest in their health or bodies is shameful. Her course is set and it doesn't include time for frivolities such as balls and soirees or love and romance. But then Ethan Ransom re-enters her life and brings with him flutters and desires that refuse to be denied. Ethan Ransom is not the man for Dr. Garrett Gibson. He knows that someone as special as the lady doctor deserves a much better man than he but, even knowing that, he can't seem to keep his distance. Ethan is a man of the shadows, with rough origins, lethal skills, and a secret government job that could bring deadly danger to Garrett's door. He does his best to stay away, while still watching over her, but fate conspires to bring them together time and again and each time their fascination with one another and desire for one another grow deeper. Garrett is confident she can indulge in her body's desires without emotional consequence while Ethan has already fallen hard. He wants her with every beat of his heart but fears what could happen to her if she's pulled into his deadly world. This is the deeply romantic Lisa Kleypas storytelling that I fell in love with years ago. From beginning to end, Hello Stranger is my favorite book so far in The Ravenels series. I wasn't sure what to expect of Garrett when I started this book. In previous books in this series we've been shown a no-nonsense doctor who hasn't much of a life outside of her career but she really evolves throughout this story. I loved her strength and determination, her courage to pursue her dreams in the face of monumental odds and to take control of her happiness at the risk of damaging her reputation and endangering her livelihood. "I have to go," he said shortly, and pulled back while he was still able. But Garrett moved with him, her hands reaching up to grip his head on either side, the way he'd taught her at Baujart's. The strength of her fingers electrified him. "Kiss me," she commanded, "or I'll break your nose." There had always been a cold streak in him, but he couldn't seem to find it now, when he needed it most. He was breaking apart inside. He would never be the same after this. "Christ, you've ruined me," he whispered. It was a pleasure to watch Garrett learn to embrace her softer, emotional side without sacrificing any of the strength inherent in her scientific pragmatism and determination. Even when faced with near insurmountable odds to save someone she loves she rolls up her sleeves and marches into the fray, doing what she had been trained to do and refusing to allow emotion or fear to overtake her until every possible medical procedure has been completed. She has enormous strength of will. I admired her, liked her, and happily cheered her on throughout her journey. She is a heroine I will not soon forget. "The first moment I saw you, I knew you were my share of the world. I've always loved you. If I could choose my fate, I'd never be parted from you. Acushla...pulse of my heart, breath of my soul...there's nothing on this earth more fair and fine than you. Your shadow on the ground is sunlight to me." ::Sigh:: Added to that, he has an innate sensuality and a heart that beats solely for one unconventional woman not in spite of her intelligence and skills but, in large part, because of them. I mean, really, how could I not fall in love with him? One of the things I most enjoyed about this book was how good Garrett and Ethan are as a couple. They bring out the best in one another, complement each other's strengths and weaknesses. They are each strong individually but stronger together. Neither is diminished by the other and while there are times in the story when Garrett is rescued by Ethan there are others where Ethan is rescued by Garrett. Their love is deep and enduring but they also like one another, admire one another, desire one another, and, in the end, they save one another. For fans of the series, West Ravenel has a fair amount of page time in this book. The scenes between West and Ethan were some of my favorites in Hello Stranger and have upped my anticipation for West's story. I hope we'll be seeing more of Ethan and Garrett in future books as well. I haven't had nearly enough of them! Have you read Hello Stranger yet? What did you think? Who is/are your favorite Lisa Kleypas characters? Are you as excited for West Ravenel's story as I am? One randomly chosen person who posts a comment before 11:00 PM (Eastern), March 10 will receive a print copy of Hello Stranger from the publisher. U.S. and Canadian addresses only. I enjoyed this story. Garrett and Ethan were a great couple. Some reviewers complained about the conspiracy plot in the last book thinking it was just dropped in there. I always assumed it was there for a reason and I liked how it was resolved in this book. My favorite scene actually wasn't one of the romantic ones; it was the scene where Garrett performs surgery. Lisa Kleypas did an excellent job in showing the reader how a 19th Century doctor would extract a bullet that tore into an artery with the potential problem of sepsis. It was gripping, yet West's humor was great at easing the tension. West steals every scene he's in, so I'm looking forward to his story. I have been looking forward to this book, and I expect it in the mail any day now. By the way, I love the colors on this cover. It really catches your eye. I enjoy Lisa's captivating novels. Devil in Spring was wonderful and Lady Pandora and Gabriel are memorable characters. I would love to read this novel. No, I haven't read Hello Stranger yet, but of course I'm desperate to read it now, especially after your brilliant review. I love all the characters the Lisa writes about. Some of my favorite characters are from Mine Till Midnight,Seduce Me at Sunrise, Devil in Winter, and most recently Devil in Spring. Yes, I'm definitely excited about West Ravenel's story. I hope that we don't have to wait too long for it. I look forward to reading it! i am excited to read about West Ravenel as well! I am very interested in reading this wonderful novel and West Ravenel sounds fascinating and intriguing. just read it and loved it. they are such a good match and ethan, the man does have a way with words at times poor garrett never really had much chance. ;) I'm with you on it being my fave of the series so far. may be hard to top this one, but looking forward to west's story all the same (if the tease is any indication it'll be great too, plus perhaps more of one of my fave couples from the past seb & evie). Have not read this book yet. In the past, I was a HUGE fan of Ms Kleypas. I have some of her early books on my keeper shelves. Then for me, something changed. I no longer fell madly in love with every one of her books. You have made me realize it is time for me to get back into her books. I thank you so much for this review. It does remind me of the passion and wonderful characters I used to love. I am currently reading my first book of Lisa's-It Happened One Autumn, would love to win this-thank you. Hello, Stranger is my favorite in this series too, PJ. It has everything that made me fall in love with Kleypas's writing years ago. I think this is her best historical since Love in the Afternoon. I also agree that West is a heart-stealing character, and I eagerly await his story. I try to avoid teasers because they make the wait for the book more difficult. As much as I love the Wallflowers, the Hathaways, and some of the Ravenels, My favorite of Kleypas's historical characters will probably always be Derek Craven and Sara Fielding from Dreaming of You and and Sir Ross Cannon and Lady Sophia Sydney from Lady Sophia's Lover. I have a separate list for her contemporary characters with Jack Travis (Smooth-Talking Stranger) and Sam Nolan (Rainshadow Road) tied for the top spot. I haven't read this story but am a fan of the author. My favorite is Dreaming of You, Derek and Sara's story. And I am always excited about stories from this author. I haven't read Hello Stranger yet, I had read all of Lisa's books a few years ago, but haven't cuaght up with the more recent ones yet. I haven't read it yet although I have read the other books in this series and enjoyed it. I like The devil in Winter the best out of all this writer's books. I thought that Evangeline and Lord St. Vincent were great together. I have been told by a number of people that I need to read Lisa Kleypas and I can see why. Thanks for the review. 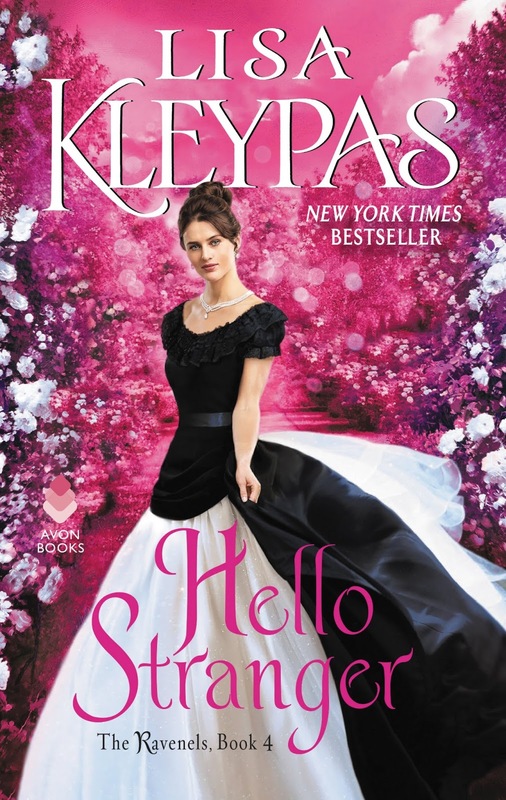 I have a copy of Hello Stranger practically yelling at me to read it--which I very soon will, just as soon as I finish a last book in a series I've been reading. My favorite characters are from my favorite books by Lisa: Suddenly You (Amanda Briars and Jack Devlin) and Devil in Winter (Evie and Sebastian). I've lost count of how many times I've re-read those two books. Also, Nick Gentry from Worth Any Price was an early favorite of mine when I first started reading LK. I'm always happy about a new Lisa Kleypas book and I have waaaay too many favorite characters to list! This one is at the top of my TBR list. Thanks for the giveaway. No matter what his other characteristics are, this shows his heart and soul. I have not yet read any of her Ravenel books, but will definitely have to start the series. I usually start at the beginning of the series and then read the books in order. This one is too tempting to wait that long. I have no favorite of her characters. It has been a while since I read one of her books. I have a couple of her series sitting on my TBR shelves. I haven't read this one yet as I've only read the first two books in this series but I'm looking forward to it. Picking a favorite Lisa Kleypas' character is tough since I love so many of them from the Wallflowers to the Travises to the Hathaways and now the Ravenels. But if I really had to choose one it would be Beatrix Hathaway for her menagerie of animals and her witty, charming letters to Captain Christopher. I haven't read this book yet, but look forward to doing so, especially after reading your review. Thanks for the great review. I'm looking forward to the perfect rainy day when I can settle down and re-immerse myself in Lisa Kleypas' magic! I haven't read this book yet. Looking forward to meeting the Ravenels. Thanks for the chance. I can't wait to read this one, Lisa's books are always so well written, thanks for sharing your review. My favorite is Leo Hathaway although there are many to choose from! I just finished this book! Without a doubt one of the best books Lisa has ever written. I loved Garrett and Ethan. The story just naturally unfolded. Just wonderful.